Admittedly sometimes, just sometimes, I have a short attention span and tend to get bored easily. I allowed myself to get completely distracted over the weekend which resulted in some doodling and then some piecing. Sketching out an idea is a rarity - I even had to borrow the pencils from the teens. Quilts are normally planned in my head and often inspired by traditional quilt designs. From there the colors and fabrics just happen. I don't have any color theory knowledge and although I've heard of the color wheel I use my own instincts in choosing colors and fabrics. I also sampled two different blocks sizes to get a better idea of the overall effect. My head tells me to go with the bigger blocks, my heart with the smaller blocks. The heart rules. 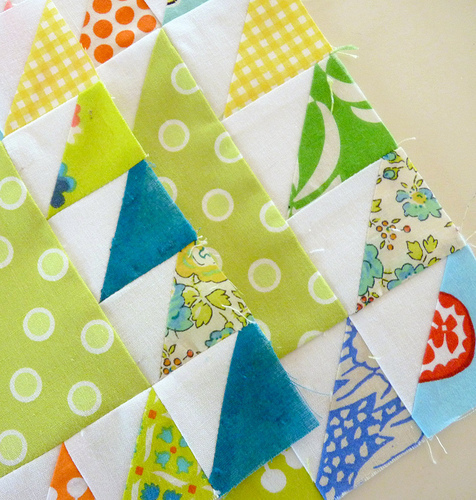 I've pieced a whole bunch of Half Square Triangles from 2 1/4 inch squares. Chain pieced and individually trimmed back to exact size. These HST's measure 1 3/4 inches and will be 1 1/4 inch finished patches. Call me a little crazy. Maybe. crazy, but in a really genius/brilliant kind of way. Do to the help of my cat! I post an illegible post and removed it.! What I was trying to say was.... Once again you spike my interest and make me want to see where you're going. I like the way your mind works. So far so good! Cant wait to see where these pieces go. Complete and utter nutter if you ask me!! All the best people are though. Those are very small triangles - can't wait to see the madness that unveils :P.
The colours are fantastic!! I love crisp, little triangles. Oh to be SO-O-O crazy!!!! i can't wait to see the finished masterpiece!!! Nothing I love more than teeny weeny fiddly sewing! It looks great, can't wait to see it come together. Crazy - NOT. Inspired - YES. Wow! Think of all those little seams. No doubt you will turn out aanother masterpiece that we will all gaze upon in awe. 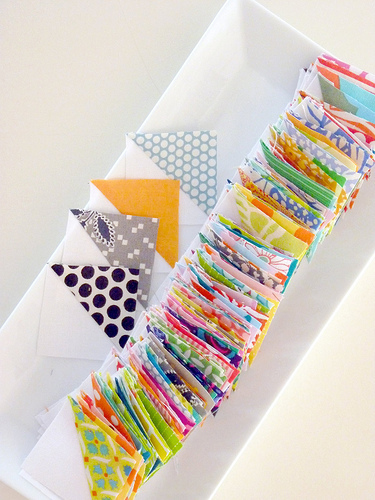 I saw your Hourglas-Quilt some time ago on your blog. I tried to do one by my own and now it is finished. Thanks a lot for your inspiration. Nope, won't call you crazy. Though it's been a while, I love smaller blocks. we all need to go crazy sometimes - you always do wonderful work! thats are looking very fine. I am also like to sew so little things. it will be a very fine work. I love the precision and can't wait to see what you come up. Love your color choices. Looks wonderful. Such tiny pieces, but so pretty. Love & blessings from NC! I love the colors you are working with. This will be gorgeous, as always, I'm sure. OMG ! You are crazy..but it will be absolutley gorgeous ! Can`t wait to see the progress ! Go with your heart, I find it is always right. This is going to be another fabulous quilt. This is going to be lovely. Your fabric choices are great. Oh, this is going to be really pretty, Rita ! I love this design and the fabrics you have chosen - I am sure it will be another great quilt - and yes, always follow your heart! Wow! Looks like another fabulous quilt is in the works. LOVE those colors! Love it! I'd like to know whether you press your seams open or press them to one side. Thanks! Thank you everyone for your very kind comments. I love and truly appreciate them all. 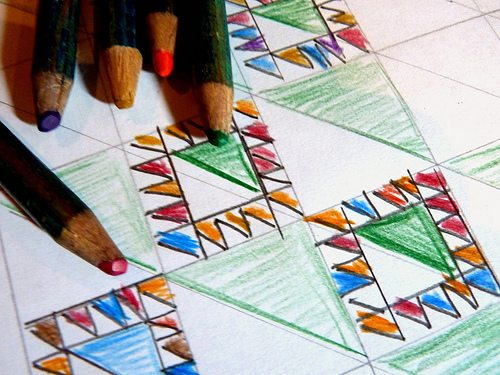 In this instance the seams for all of the Half Square Triangles were pressed to one side, the darker side. I almost never press seams open.